The Artifact Hunt event is hot now in MapleStory! 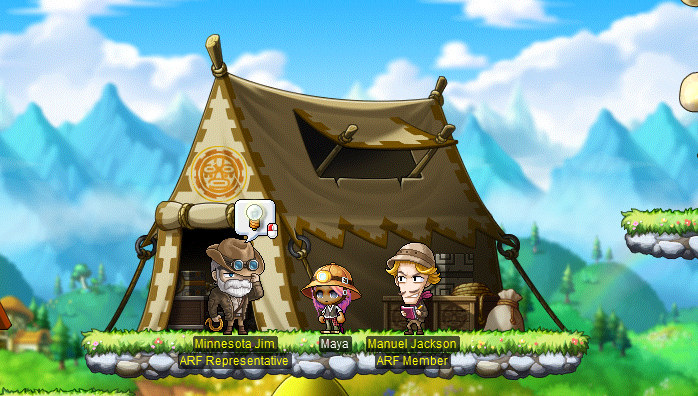 It's time to collect artifacts when you explore the Maple World. There are some artifact monsters around the mysterious artifacts. What you need to do is defeating them and earn Artifact Points which can be exchanged for rewards. Every true explorer needs a tool bag! Each day when you log in, you can speak to NPC Manuel Johnson to receive an Excavation Tool Pouch. Open the pouch to receive 1,000 Artifact Points! Log in and collect your tool pouch every day for 5 days, and you’ll receive a Big Expedition Hat Coupon. The coupon is tradeable within your account, and when you use it you’ll receive a permanent Big Expedition Hat. You don't always have to go far afield to find artifacts! Large Unearthed Artifacts are appearing in major towns (Henesys, Leafre, Haven, and Craw Village). 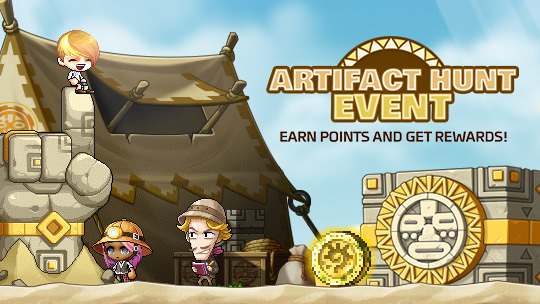 Defeat one to receive Unidentified Artifacts and get more Artifact Points. These artifacts also have the potential to drop the Ancient Guardian Chair. Players Lv. 33 and above (Zero characters must have completed up to Chapter 2) will be able to begin by clicking the event notifier on the left side of the screen and selecting the quest ‘[Artifact Hunt] Finding Ancient Artifacts’. Hunt monsters within your level range (10 levels below and 20 levels above) to acquire Unidentified Artifacts, such as pottery, masks, or tablets. These artifacts give you varying amounts of Artifact Points. You can earn a max of 10,000 Artifact Points per world per day. • Excavator Extraordinaire: Receive 2x the amount of Artifact Points for 10 minutes. • EXPert Excavator: Receive 2x EXP for 10 minutes. • Excavator's Exuberance: Gives Weapon ATT/Magic ATT: +20 for 10 minutes. Can only be used 6 times per day. Excavating artifacts can be dangerous, as you may awaken Rhinojinn! 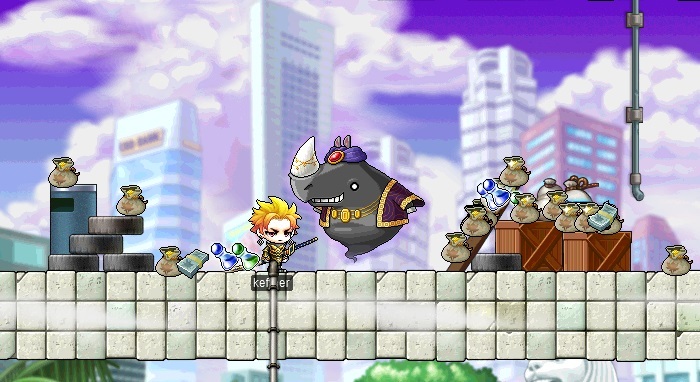 Defeat him to receive 6 Ancient Artifacts, which contain mesos, EXP, or 100 Artifact Points. Surprisingly, Rhinojinn also has the potential to drop the Ancient Guardian Chair! In addition, based on how many points you earn over the course of the event, you’ll receive the following rewards. You can only collect each reward once per world. To receive the rewards, speak to NPC Minnesota Jim and select each reward that you qualify for. Furthermore, there is a new April Weekend Event you can participate in. Firstly, you need to log in during the weekend of April 1 and 2, and then accept the quest '[Artifact Hunt] Weekend Gift' to receive a 7-day Hieroglyph Damage Skin! 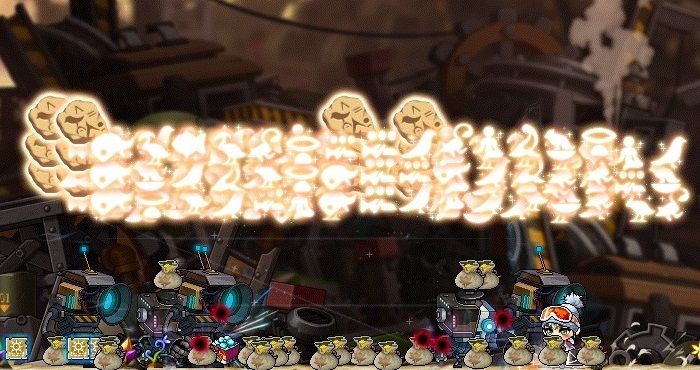 Remember that one permanent damage skin per world. Finally, the Artifact Hunt event concludes on Wednesday, April 5.